THX, the sound innovation company founded by George Lucas, filed suit against Apple in the U.S. District Court for the Northern District of California on Thursday, claiming that various models of the iPhone, iPad and iMac product lineups infringe on a single speaker patent for a "narrow profile speaker." According to the complaint, Apple knowingly infringed and continues to infringe upon THX's U.S. Patent No. 7,433,483 for "Narrow profile speaker configurations and systems," a property granted in 2008 describing methods to effectively enhance sound quality in compact speaker arrangements integrated into consumer electronics like computers and televisions. As noted by Bloomberg, THX claims Apple's violation caused monetary damages and irreparable harm, and seeks royalties or damages to make up for lost profit. Best known for its theater sound technology, THX was founded in 2002 and holds numerous patents relating to speaker hardware and acoustics technology. With the company's compalint against Apple, THX is leveraging a specific property covering a system that delivers quality audio from a speaker disposed in a confined area. More specifically, one of the patent's claims notes the output aperture, sometimes referred to as the speaker duct, is relatively more narrow than the speaker face. The '483 patent also describes a system in which a sound reflecting surface is parallel with the the drive unit, or speaker face, and mounting surface, with sound dampening material placed around the reflecting and mounting surfaces to create an acoustically isolated environment. Sound is channelled toward a narrow sound duct which is positioned at a right angle in relation to the drive unit. Alleged infringing devices include iPhone models from the 4S onward and undisclosed iterations of the iPad and iMac. Looking at the patent claims, there appears to be some correlation with the configurations used in Apple's products. Perhaps most compelling is the latest iMac's speakers, which features an extremely thin profile with channeled acoustics exiting down-facing apertures that are more narrow than the speaker faces hidden within the machine. It is unknown if the speaker housings actually employ '483 patent's designs, though the structure looks to be similar to those described. 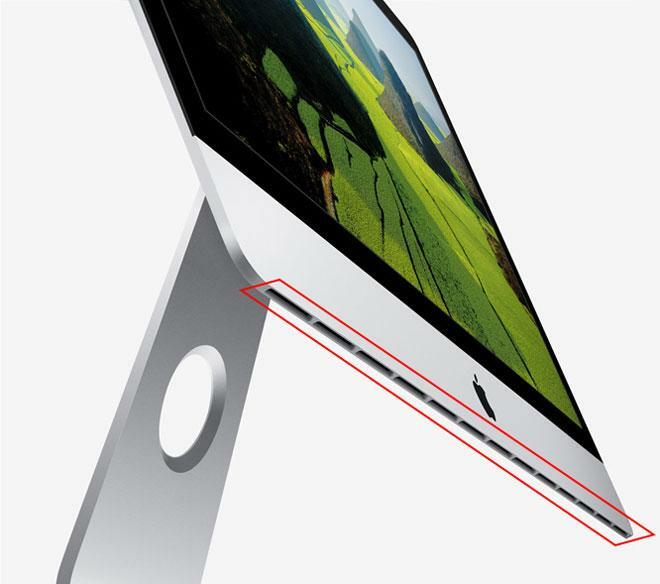 The new iMac's speaker aperture shown in red. 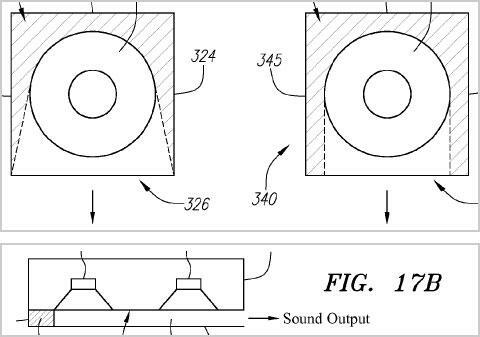 For its part, Apple also owns a variety of speaker-centric patents, including those directly related to implementation with portable devices like the iPhone and iPad. Most recently, the company was granted U.S. Patent No. 8,385,568 for "Low-profile speaker arrangements for compact electronic devices," which could substantially share some claims with the THX patent in suit. The '568 patent will likely not be used in Apple's defense, however, as it was filed for in 2010 and granted in February 2013. The Cupertino company does hold sound technology patents pre-dating the '483 property, though it may come down to a decision over patent validity, if the case moves forward at all. As devices become increasingly thin, the number of methods in which speakers can be effectively implemented within a given chassis is greatly reduced. Apple's last day to meet and confer with THX counsel and the court over initial disclosure, an early settlement and other stipulations is May 14. The deadline for initial disclosures is June 7, while the initial case management conference is scheduled for June 14.